Review of smile makeover with Snap in Dentures! - Happy Patient Case! You are here: Home / Blog / Cosmetic Dentistry / Review of smile makeover with Snap in Dentures! Review of smile makeover with Snap in Dentures! We are back with an amazing case of mouth restoration and smile makeover with Snap in Dentures. Our mini implant dentures are an amazing option for people who have no teeth left or will likely need full dentures in the future. Snap in Dentures are an affordable treatment that consist on placing 8 mini implant on the upper or lower jaw that will serve to anchor a removable denture adapted with o-rings and no roof of the palate. They are secure and strong, letting you eat and smile confidently without having to worry about messy glue and embarrassing accidents. Randy had been told he had no solution for his dental problems. Dentists in USA were cold and uncaring telling him he would either have to do without teeth or giving him an estimate of $60,000 USD for an implant denture procedure which it was completely our of his budget. He then found Cancun Cosmetic Dentistry and looked at our videos, reviews and testimonials. He was impressed by the work of Doctor German Arzate and his team of dentists. 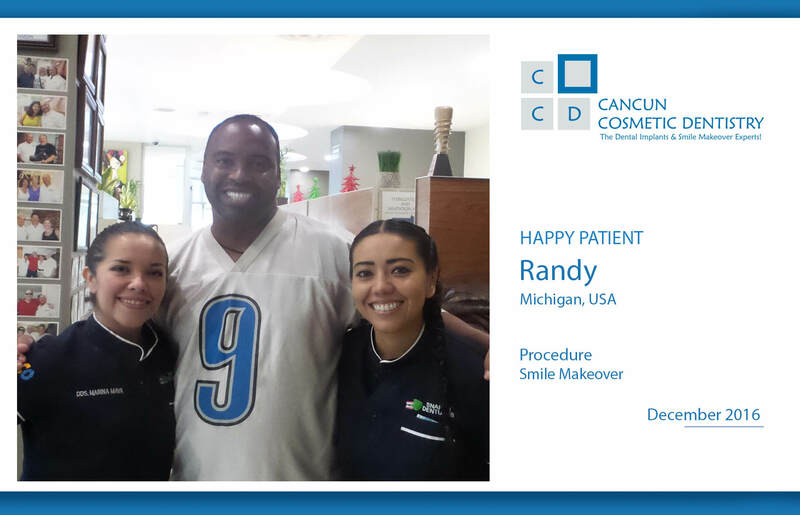 He got in touch with Claudia, one of our dental planners, and slowly but surely he managed to come to Cancun after almost two years of coordinating with them. We have other patients who don’t wait that long either because they can afford it right away or they are already coming for vacations in Cancun. If you can’t come to Cancun right away, that doesn’t mean you should give up. Talk to our dental planners and we might be able to come up with a plan for you in the long run. The country is so beautiful and the people are very warm and friendly. Wanted to change my appearance. Claudia assisted me in every step. The doctors in US made you feel bad and that there was no hope but to just get dentures. My experience was amazing, Dr. German Arzate and his staff were very accommodating. They actually cared about me as a person, and not as a patient. I would recommend anyone to come to Cancun and have the treatment as well as fantastic vacation. Ready for New Year's Eve during your Dental Vacation in Cancun?